The unchallenged leader in launderable wet mops. A well-engineered blend of poly viscous and rayon for long lasting reduced lint and increased pressure on the floor.Wet Mops contain antimicrobial product protection, which inhibits the growth of bacteria that cause odors & stains.Balanced blend of synthetic fibers delivers up to five times the absorbency of cotton mops. Looped-end, open-twist yarn reduces lint. 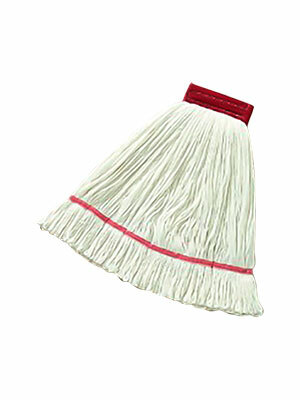 Tail band allows the mop to cover more floor area per stroke, saving time and money.